Capitalist Realism, editor of ART Margins special issue, (MIT Press) 4:3 (Fall 2015). 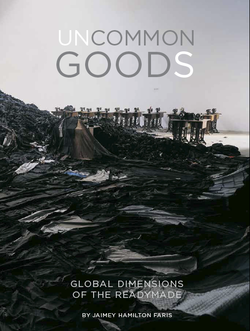 Uncommon Goods: Global Dimensions of the Readymade (Intellect Press, 2013). The practice of incorporating or appropriating “common” commodity goods in contemporary art has become increasingly pervasive since the 1990s – warehouse-sized installations overwhelm viewers with everyday detritus, relational and social-practice art catalyze and deconstruct everyday consumer and work situations, media spaces resound with appropriated and remixed images of global consumption. Art historian and cultural critic, Jaimey Hamilton Faris discusses a number of artists who have achieved international recognition with this type of work, including Ai Weiwei, Yinka Shonibare, Jimmie Durham, Emily Jacir, Thomas Hirschhorn, Christoph Büchel, Tania Bruguera, Santiago Sierra, and Paul Chan. She argues that their emphasis on our material world invites us to take another look at the hidden global dimensions of ordinary things. Hamilton Faris traces the current use of common materials in art as a renewed engagement with the readymade. She argues that artists have turned the predominate question of the readymade inside out: from one that questions the nature of art, to one that questions the nature of the commodity. What is a commodity, what do we define as predominate global commodities and how is this structure supported and maintained? The readymade object used to mean a simple appropriation of durable goods incorporated into the art frame (i.e. the urinal or the bicycle wheel), but now it includes information, media, labor and services; even land and natural resources are more available to a "readymade" prepackaged consumer market than in the past. The very notion of everyday commodity material has expanded dramatically since the re-organization of world trade in the nineties. Hamilton Faris argues that the processes of globalization parallel a rise in artists who are engaged in foregrounding typical global goods in their work in order to register, on a sensate level, the complex negotiations and ambivalences they have with the commodity’s fantastic becoming. She discusses art that addresses the ethics of international migrant labor, outsourced manufacturing, the limits of global resources, and debates over intellectual copyright. In creating extraordinary materially-intensive, unusual and in a word, uncommon, aesthetic situations, artists are asking just what kinds of global communities we have created with our international flow of goods. 1/15/14: Interview and Excerpts by the Offsetter.